This delightful holiday home is on the outskirts of the town of Haaren. The town is in the Province of Brabant between Den Bosch and Tilburg. The holiday home is in a large, wooded garden of 1400 m2. The accommodation is very comfortable and has lots of extras. Nature lovers can enjoy themselves walking and cycling in the Oisterwijk Fens Nature Reserve, the Loon and Drunen Dunes and the De Kampina Nature Reserve. A visit to the charming town of Oisterwijk with its many outdoor cafes and restaurants is highly recommended. You can also visit the capital of Brabant, Den Bosch, with its old, atmospheric city centre. The cities of Breda, Tilburg and Eindhoven are not far. You can go on plenty of day trips which children will enjoy. The famous Efteling Theme Park is twenty-six kilometres away and the 'Beekse Bergen' are eighteen kilometres. You can reach the beautiful, historic cities of Amsterdam, Delft and The Hague in under an hour and a half. Düsseldorf, Antwerp and Brussels are also excellent for day trips. This holiday home stands in a large, sunny, fully fenced private garden of 1600 m2. There are two possible options for this holiday home: For stays of up to 6 people (house code NL-5076-02), you have access to the house plus a wooden chalet in the garden with an infrared sauna with shower, toilet and kitchenette. In consultation an extra bed can be put in this chalet, f.i. if there is a need for sleeping on the ground floor. Costs are to be considered. For stays of 7 to 10 people (house code NL-5076-03) besides the sauna chalet there is a guests chalet (also in the garden) with sleeping accommodation for 4 people (double sofa bed plus bunk bed) wardrobe and TV with DVB connection . This chalet features a private bathroom with shower, toilet and sink. 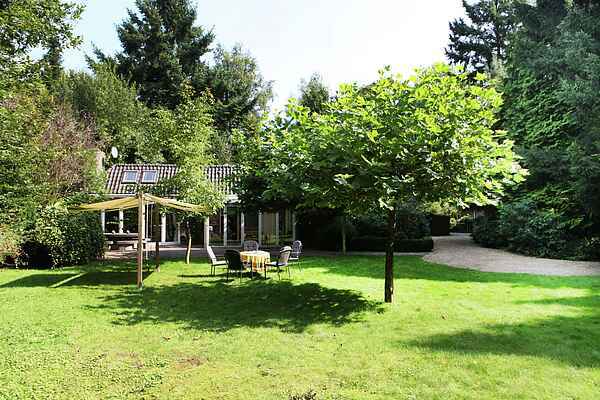 The holiday homes ' Prinsenhof' (house code NL-5076-02 / 03) and ‘Uilenberg' (house code NL-5076-05) are next to each other and are therefore very suitable for several families who want to be on holiday ‘together, yet separated’.